This is a great book, I really loved it! The authors give incredibly convincing content around a subject that is so hard for many people, that is: change. I personally love change, drive a lot of change in my own live and those around me and love anything that helps me to be more of a change agent. I expected the book to be great considering their first top selling book, Made to Stick, I also highly enjoyed and recommend. The authors take what is such a common problem and struggle in people’s lives and they break it down into pieces that are easier to understand individually yet still highly related and well tied together in the book. These concepts or sections represent what is necessary for change and are used by comparing to what is needed for a rider on an elephant. The rider is the logical, rational or thinking body of the system and responds to triggers of rationalization, fact and well thought out ideas. The problem for the rider is then the elephant itself, which cannot be physically controlled and has to be motivated to respond by triggering its emotions or by any short term influence possible. The idea then of shaping the path is to make changes to the environment and other outside influences easier on yourself and the elephant so the change can be carried through with the least effort. Find the bright spots – This aligns very well with the appreciative inquiry work I’ve discovered this year and I am happy to see the overlap and recommendation here to seek the positive aspects of a change to help drive it. I agree completely. Shrink the change – break down the change into small management parts and deal with them on a scale that makes it easier. Tweak the environment – Change the surroundings and environment to influence the change desired and lead people toward the new path, which might include yourself as well in that steering process. 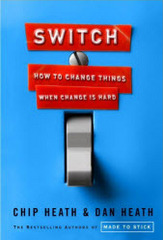 Switch take abstract and complex ideas and breaks them into easy to digest pieces through brilliant examples, memorable points and quotes and enough content to leave you thinking about the book for some time. It’s one of those books that really needs to be re-read and to some degree studied to fully digest the content. There are levels of change to consider for any situation including individual, societal and organizational levels of influence that are expanded on with each area of the book as well. So, I urge you to read Switch, let the authors educate you on how your mind reacts with both a rational side an an emotional one, explore the components of influencing change and to enjoy the perfectly matched examples and stories that both prove the points made and more importantly, teach the content in a powerful and memorable way. I can assure you its a great book, you will be entertained reading it and it will give you more power in making change happen, wherever you desire it.